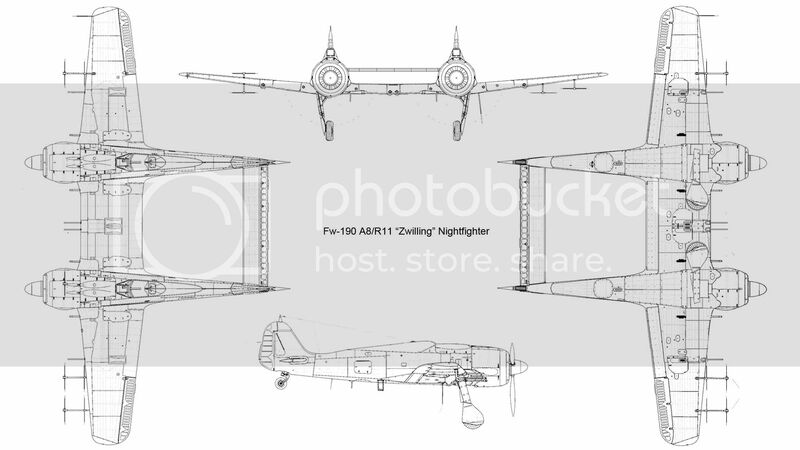 A thread for Fw-190 and Ta-152 ideas. 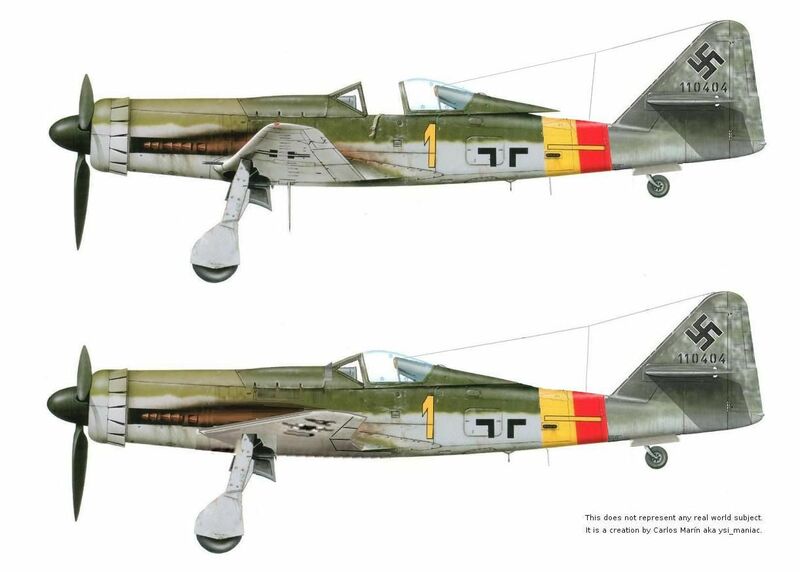 Following the success of the Bf-109Y (see here), Focke-wulf were asked to try something similar with the Fw-190. The result wasn't as successful. 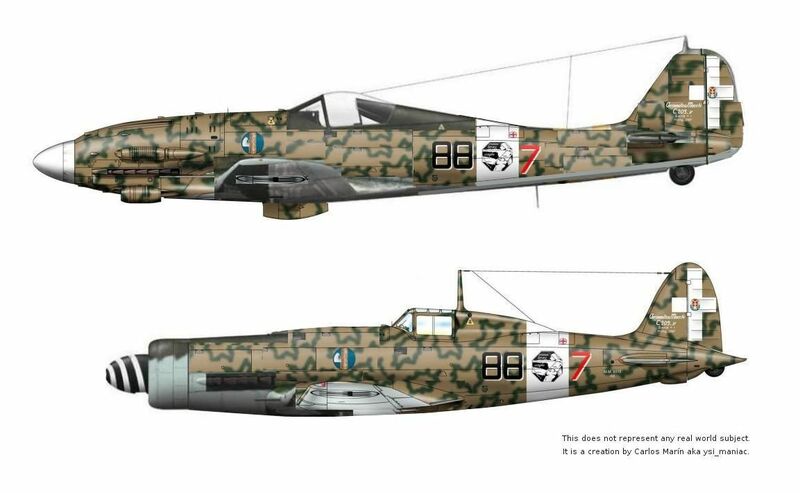 Not finding favour in the fighter role the resulting Fw-190B-2 was turned into a ground attack aircraft to replace the Ju-87 and Hs-129. A single staffel of Schlachtgeschwader 2 (SG 2) Immelmann trialed 12 during early 1943. 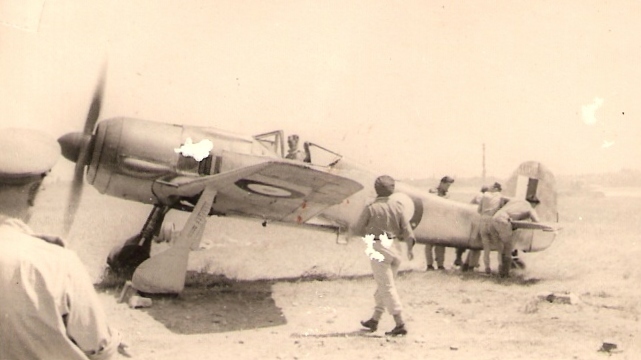 However, although the load carrying and endurance was liked, pilots reported that the aircraft was simply too unwieldy for use at low level and they were withdrawn after 3 months. 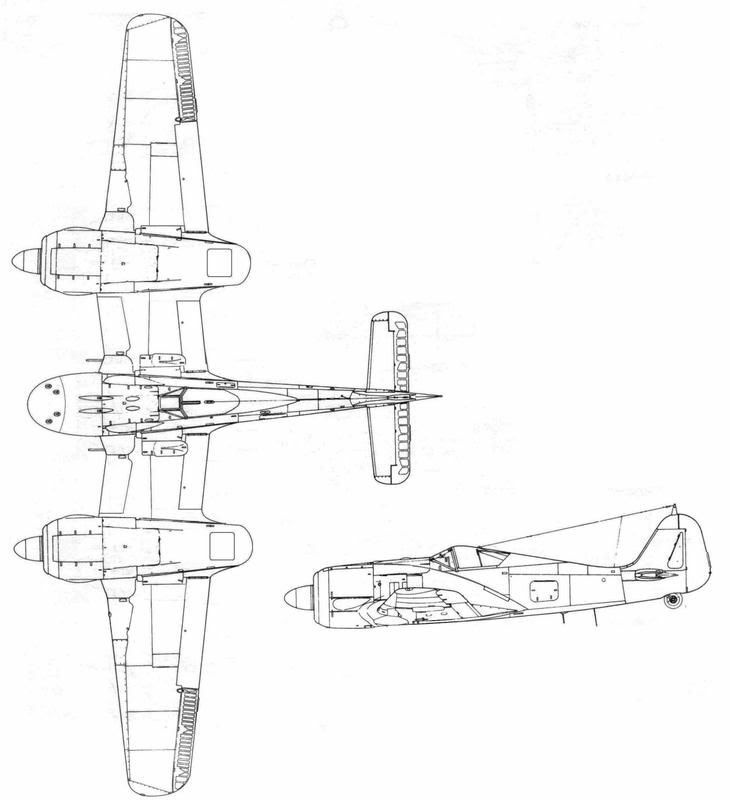 Following the failure of Fw-190B-2 ground attack aircraft, Focke-Wulf started afresh. 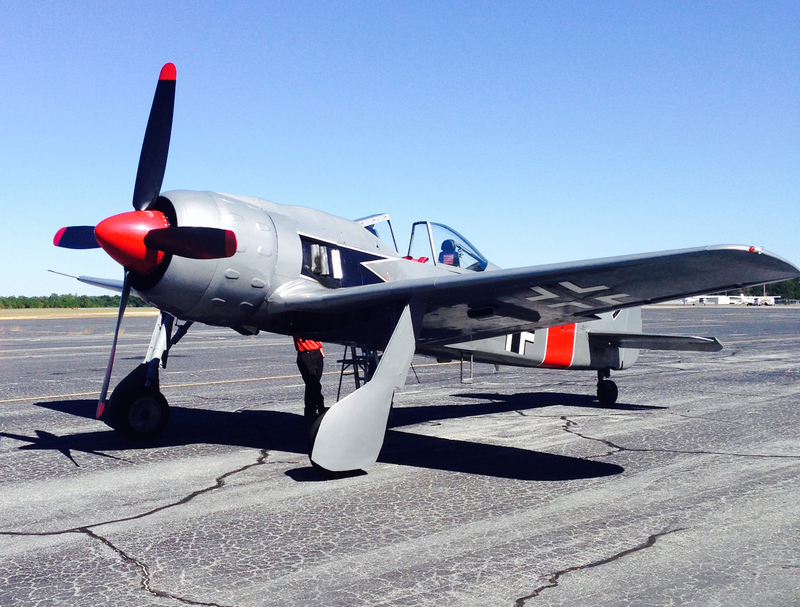 The resulting Fw-190C-1 was far more successful. In addition to being able to carry a massive payload, this time a tail gunner was also incorporated - this being at the request of front-line crews who found that rear defence was essential in the CAS/Ground attack role. Like the concept drawings. Good job. Level rear decks of a German battleship turning it into a battleship/seaplane carrier using FW-190. How about floats (partially retractable) under SR-71 in US Navy markings? 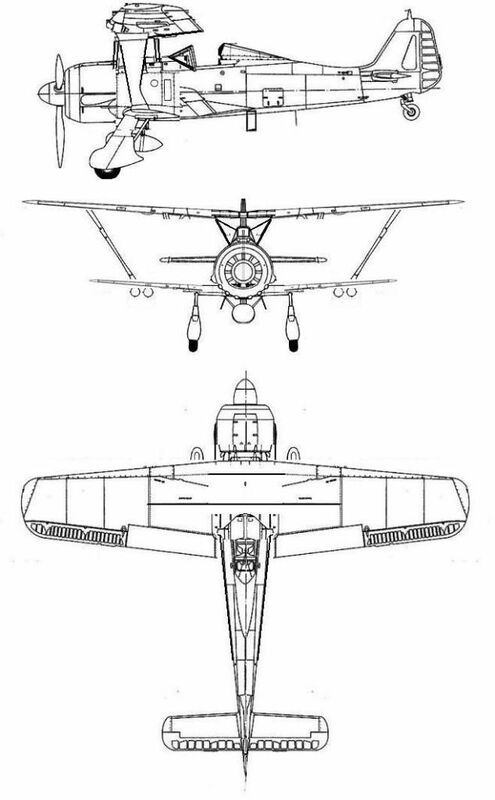 On my list of future builds is a Ta-152-based two-seater torpedo bomber along the lines of your "two-seat missle fighter". 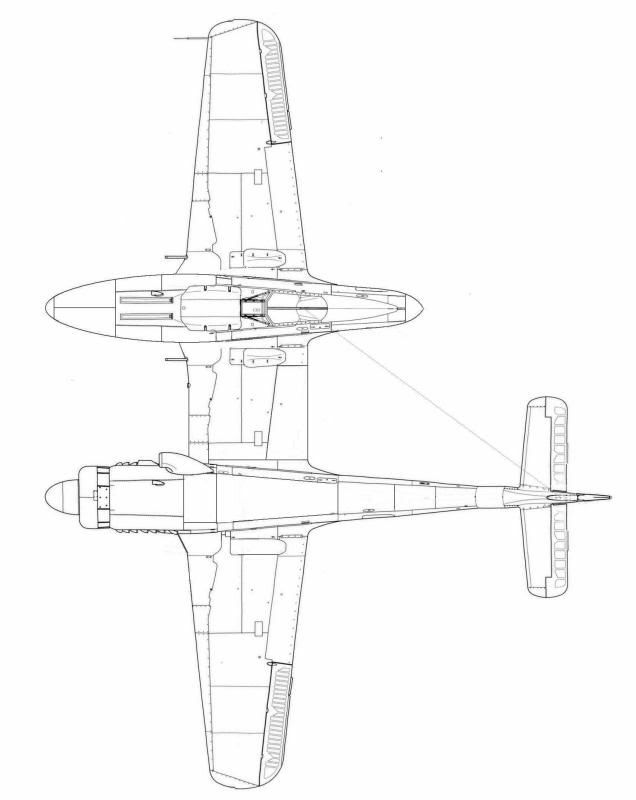 As you may know, there was a real-world Fw-190 torpedo-fighter, so extending the concept to a Ta-152 ain't too outlandish (and so what if it was??). 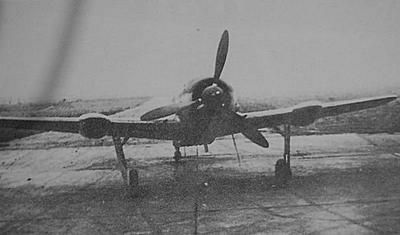 Maybe ground-pounder Ta-152 in scheme of other WWII fighters used in post-war minor conflicts: full of loads under it's long wings. 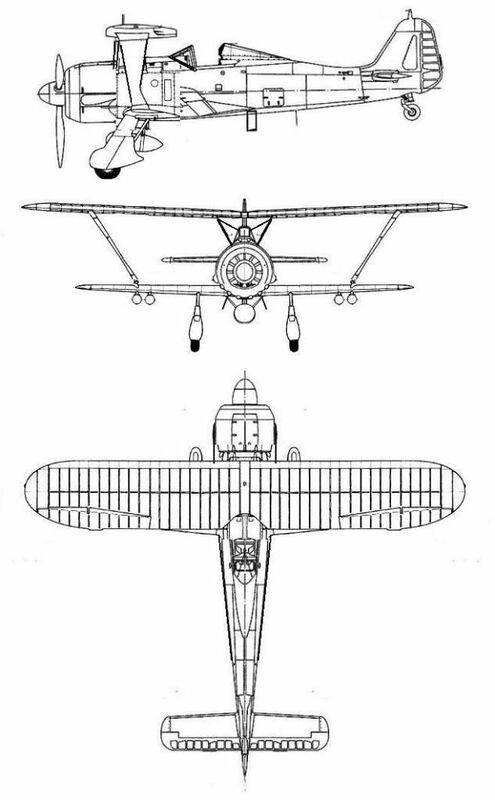 Maybe not "Nazi slaughtering Russians on Siberia", but Kaiserreich keeping colonies, and use this plane in Tanganika, or Namibia against partisants in 50ies, or 60ies. 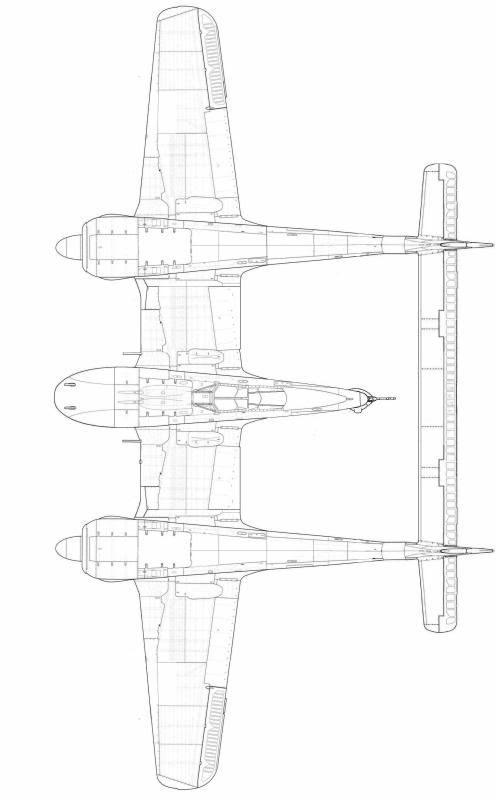 Fw-190D or Ta-152 nightfighter with two-seat canopy from FW-190S-8 and radara fit from FW-190A-8/R-11 (if memory serves me correctly). That would be interesting. Alternatively, maybe leftovers from the war sold off. Ta-152H series, USMC-Korea for photo recon duties. Post-war variants with US or British engines? 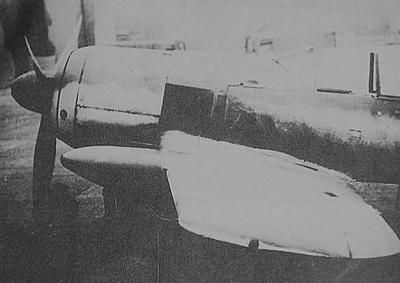 Fw-190G with Centaurus and 5-bladed prop serving, say, in French Indo-China? Or, later, in the Republic of Vietnam? 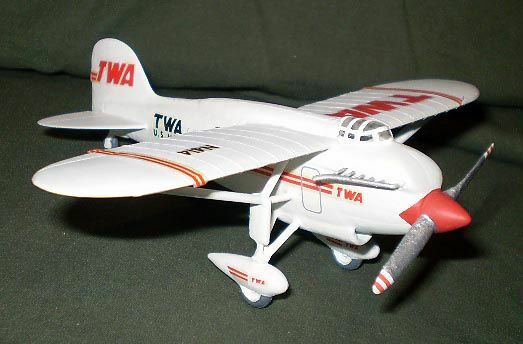 I did one of them in plastic, and used Rufe floats from the old JoHan kit. Brilliant! :) The extended rudder looks the part, too. Somehow forgot that while knocking together the profile. 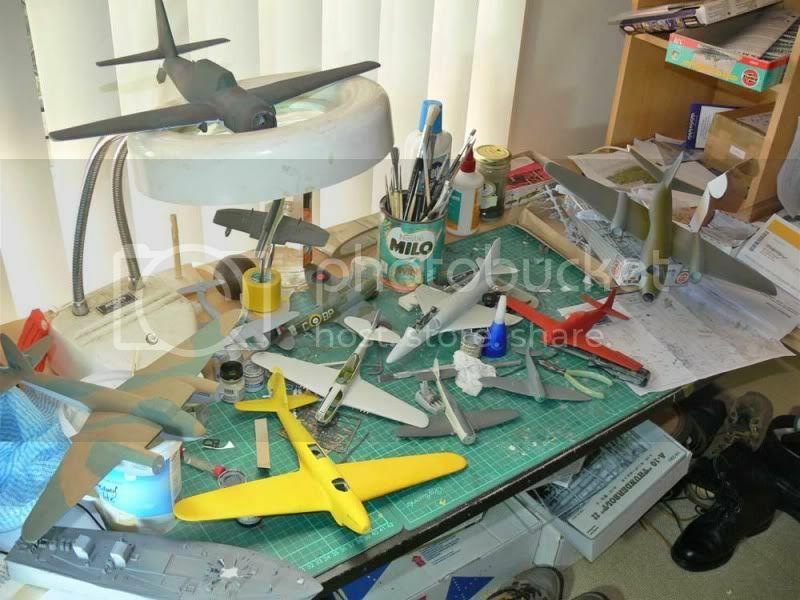 Interesting-different to go build FW-190 as floatplane. Most BTS builds are interesting-different. Where did inspiration for floatplane come from ? Thin air perhaps ? 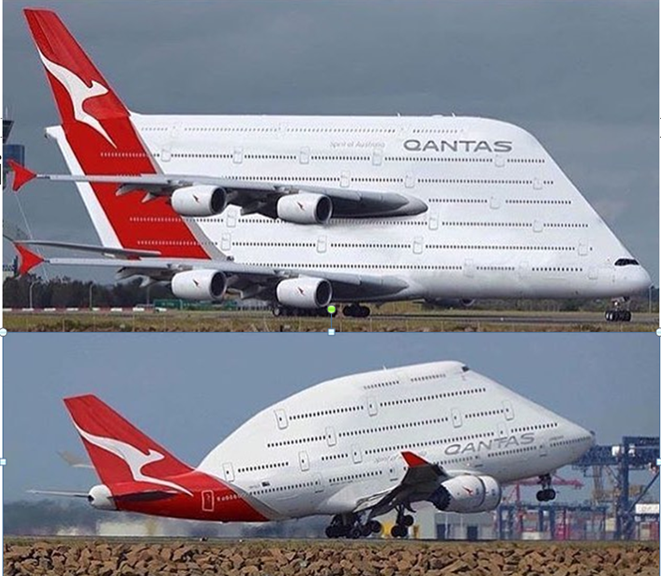 Looks like adding floats to any aircraft slows them down a bunch ! And nothing's quite so awesome as seeing a floatplane or flying boat take-off. I watched an Aquila Airways Solent lift off from Southampton Water when I was 6 or 7 maybe and I've been hooked ever since. in 1965. I've loved waterborne aircraft ever since. There were a lot of proposals around this mix. I think that something must be worth. France and Britain stand up to Germany at Munich over Czechoslovakia to the point of mobilising ready for war and Germany backs down. Hitler is humiliated and attempts to assert his authority through a campaign of terror against those he perceives are his enemies, this backfires resulting a public uprising where he calls out the army and orders them to fire on unarmed civilians, the soldiers refuse and their officers back their men. 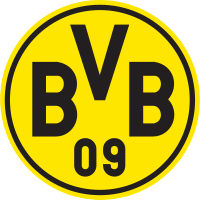 The mutiny become a coup, Hitler and other senior Nazi officials are arrested on charges of treason. 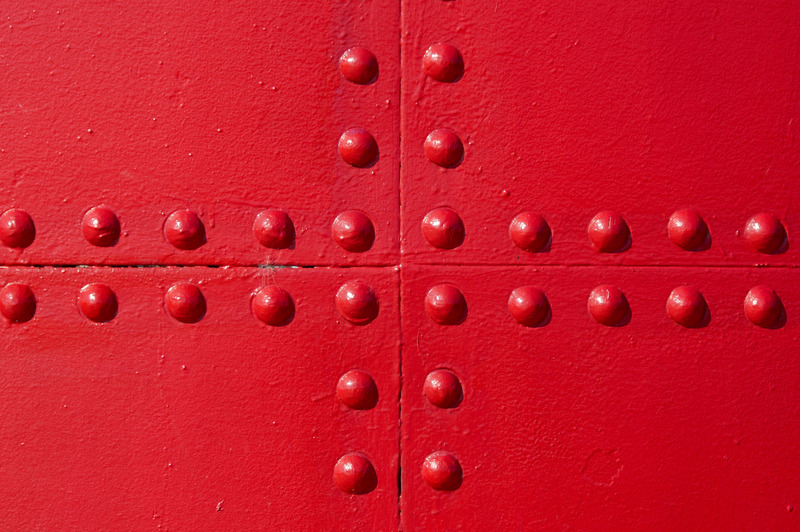 General elections are held and a social democratic coalition wins power. WWII starts in May 1940 when the USSR invades Poland and the Baltic states before turning on Germany, France and Britain declare war on the USSR for filling their treaty obligations to Poland. That war rapidly reaches a stalemate in Europe but the USSR moves against Iran and Iraq as well as the Balkans and into the middle east and North Africa. Japan attacks Pearl harbour on December 1 1941 catching the USNs carriers along side and moves against the DEI, Malaya and Singapore in early 1942. 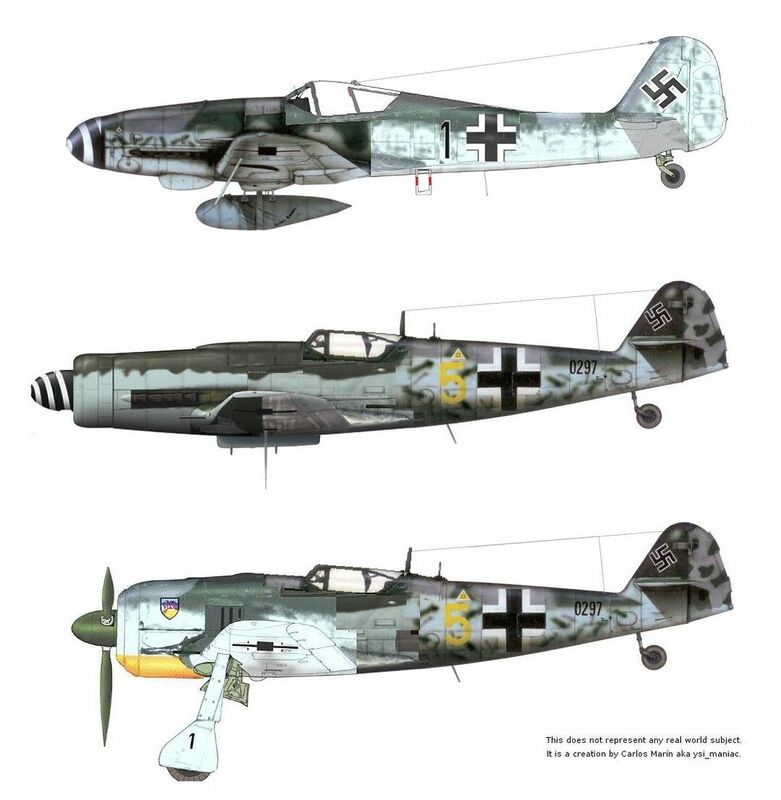 Germany has been exporting war materiel to its western allies thus Dutch, British and Australian forces employ the FW190 as their primary fighter bomber in SEA and the Pacific against the Japanese. Watch for this one at Reno next year ! Thanks for that, makes it more plausible. 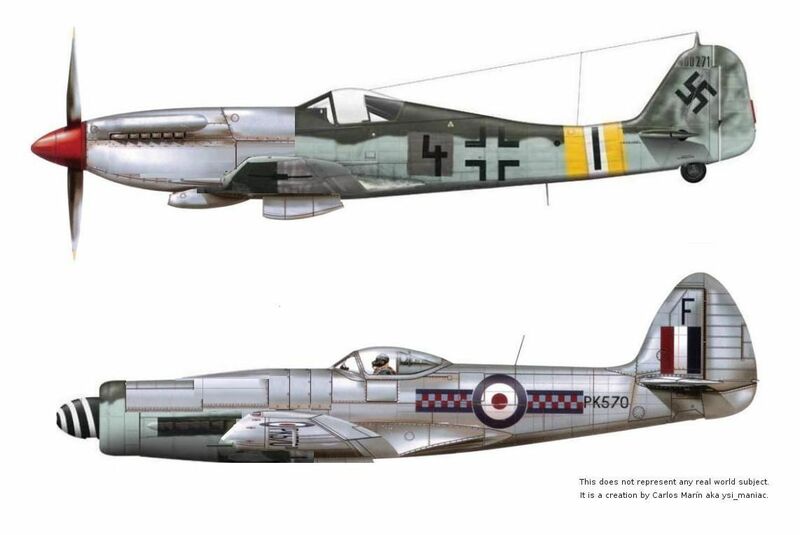 Odd thought, immediately post-war developments of the Fw-190 with either the Centaurus or R2800 in place of the BMW engine. 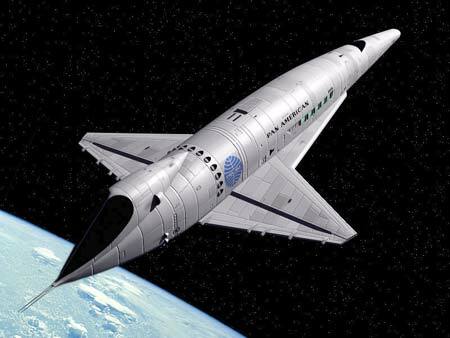 R-2800 would be a better fit, the Centaurus is larger in diameter and heavier. My goodness. What a long nose there! Pinocchio, what lies have you been telling? Text: There was a what-if class at 08 Open in Stockholm a few weeks ago. The only thing these aircraft have in common is that none of them ever served in the Swedish Airforce. Apart from the Draken that never served in the USAF! Enjoy! 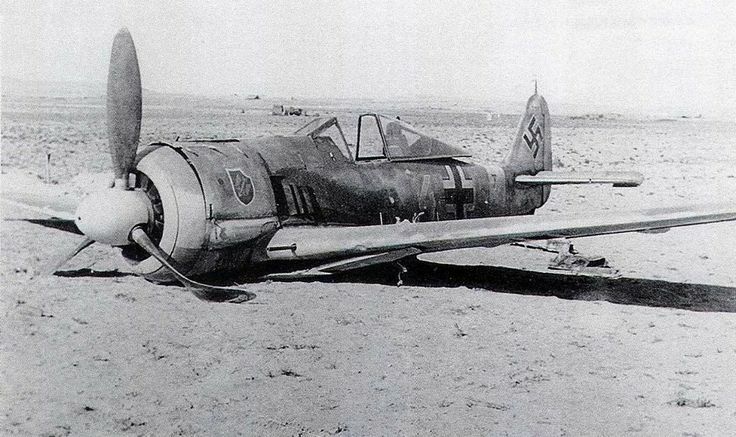 The Fw 190's wide-track landing gear would undoubtedly have made it a more stable platform than the Bf 109Z on a rolling and pitching carrier deck, don't you think Greg? Where's the artwork from, may I ask? 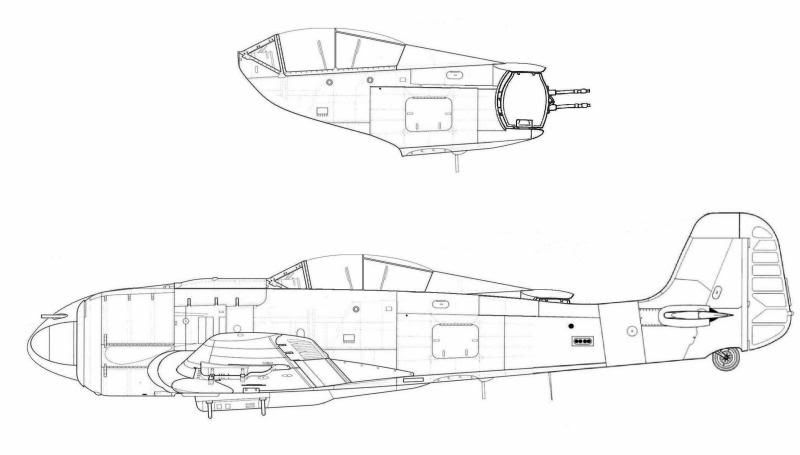 Something about the carrier based Fw 190 drawing makes me think Japanese. Overall style? 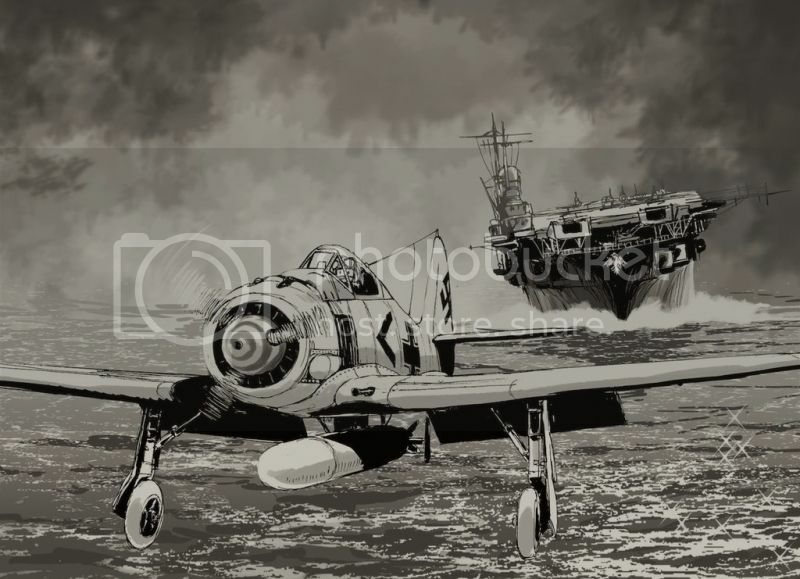 The way the pilot is drawn? 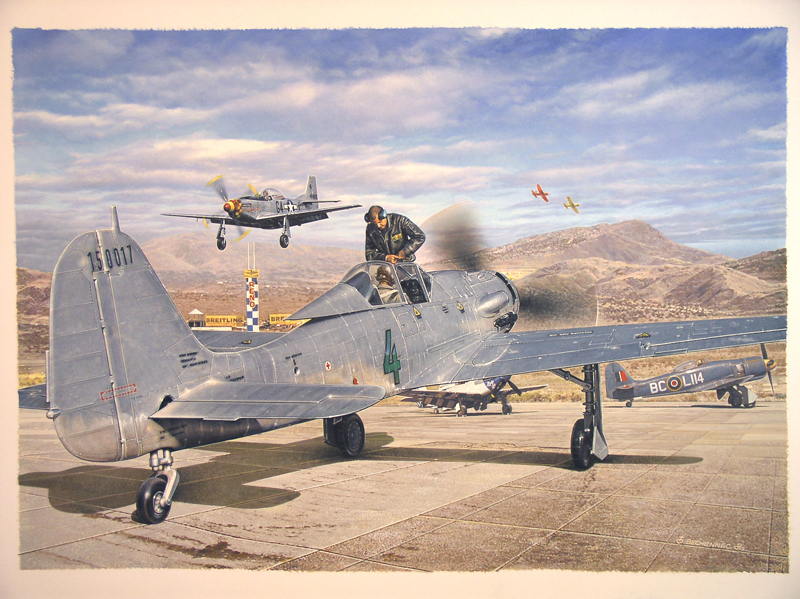 FW-190 with Skyraider wings and ordnance loadout.